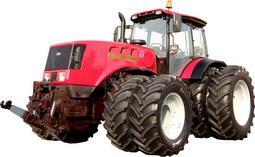 The high-power farm wheeled tractor BELARUS 3022DC.1 is equipped with a 303 h.p. diesel engine BF06M1013FC (DEUTZ), certified under the 2nd stage of Directive 2000/25/EC. It is a 4x4WD model of drawbar category 5,0, designed for various agricultural works with mounted, semi-mounted and trailed machines and implements, for transport with loading-unloading facilities, with harvesting units, for driving of stationary agricultural machines. It is intended for long-term operation in the reverse mode and is distinguished by availability of the reversible control station with additional steering column, duplicated clutch, brake and fuel intake controls as well as special reversible seat for operation at standard and re-verse travel. This tractor can be used for tilling at a great pace, chiselling and cultivation, seedbed preparation, for sowing of grain crops and other crops in assembly with wide-range and combined aggregates, for intertillage by wide row-spacing, for harvesting operations in assembly with high-capacity harvesting aggregates on fodder conservation, for grain crop harvesting, for transport and loading operations. Installation of reducing gear permit to use the tractor in road-building, for reclamation and earthwork operations, that increase considerably annual working time of the tractor and economical efficiency of its use. Wide range of ballasting due to installa-tion of the ballast and filling of the wheels with liquid, possibility of mounting of different wheels sizes, including twinning of the wheels allows to use the tractor on grounds with different carrying capacity. This tractor can be used for cropping, for bedding and ridge splitting. The universal hydraulic lift linkage with joystick control on the basis of controlled axial-plunger pump Bosch-Rexroth guarantees draft, position and combined control of tilling depth, it has five sectional distributor with electro hydraulic control and with possibility of function programming of hydraulic system (ESH), electro hydraulic control regulator of front- and rear-mounted implement.